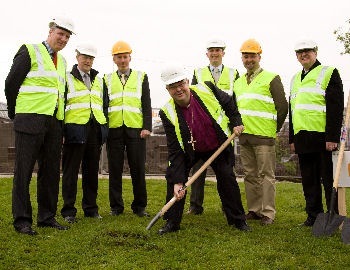 The Bishop of Cork, the Right Reverend Paul Colton, as one of the co-patrons (with Cork City VEC) of Ashton Comprehensive School, recently ‘turned the sod’ to start officially the development of the school’s new three-storey building. The Board of Management, under the chairmanship of the Bishop for the last 12 years, and now with Mr John Deane as Chairman, has been lobbying for that entire period to secure development of the new €6.5 million project. The Bishop hard at work – being watched by the professionals! This new state of the art building will integrate the gracious Georgian building (Ashton House and former Cork Grammar School) affectionately known as ‘the Old Building’, as well as the existing Sports Hall. Early in 2012, Minister for Education and Skills, Mr Ruairí Quinn, T.D., sanctioned commencement of the project. The school Principal – Mr Adrian Landen – described this as ‘an exciting time for the school -students, staff and parents’. 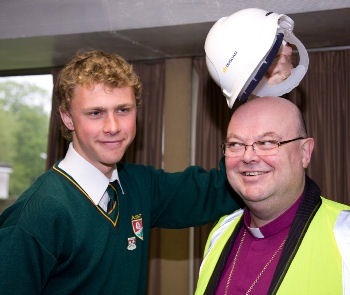 Head-boy of Ashton – David Wolfe – kits the Bishop out with a hard hat.